I'm actually a little surprised how calm the folks in the region seem to be. I usually use the bread isle at Giant as a measure of how scared folks are, and there was still an impressive selection at 4pm today. Earlier today at Cost Co nobody was hoarding batteries or flashlights (not to mention 40lb bags of rice) -- people just seemed to be doing their normal Sunday thing. 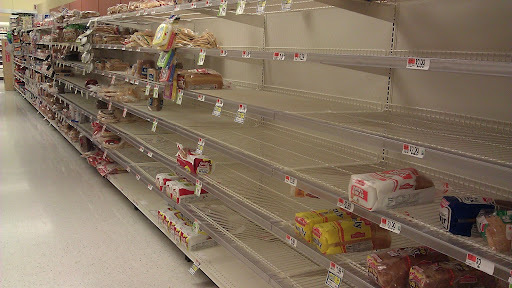 So folks are either prepared for Sandy and ready to take her in stride, or they are completely ignorant. Seriously, I've seen more tension from a few inches of snow than I have for this massive and unprecedented storm.